Join me this Sunday, May 18th at 1:00 p, for the third of this spring's Westcott Sunday Architecture and History Walking Tours. The tours are free, and are sponsored by the Westcott Neighborhood Association with support form UNSAAC. Phelps Street, now Harvard Place, was already attracting residents by the early 1890s. Houses are shown as built on the 1892 Sanborn insurance maps, and that same year we read a notice in the Evening Herald of June 25, 1894 “To Rent—NEW QUEEN ANNE HOUSE on Phelps street. Fourteenth ward with bath, furnace, gas,. Etc. Rent reasonable: new electric railway. F. A. Knoblach ….” The name of Phelps Street was changed to Harvard Place in 1912 as a result of a petition from residents. (Syracuse Herald July 2, 1912) Apparently there was less red tape one hundred years ago, since the change went through by July 9, 1912. At the Northeast corner of Harvard Place and Allen Street is a fine late example of the Queen Anne style. It was built ca. 1900 and occupied for many decades by cement-maker Frederick Morecroft and his family. At the corner of Harvard Place and Fellows Avenue is the T. Aaron Levy School, designed by Albert Brockway and opened as the Nottingham Junior High School in 1924 (soon changed to High School). Allen Street between Harvard Place and East Genesee Street was developed by in the late 19th century by James Pennock (1842-1929), these blocks have some of the biggest houses in the Westcott neighborhood, and today after several decades of repair, renovation and revival this is one of the lovliest streets in the city. 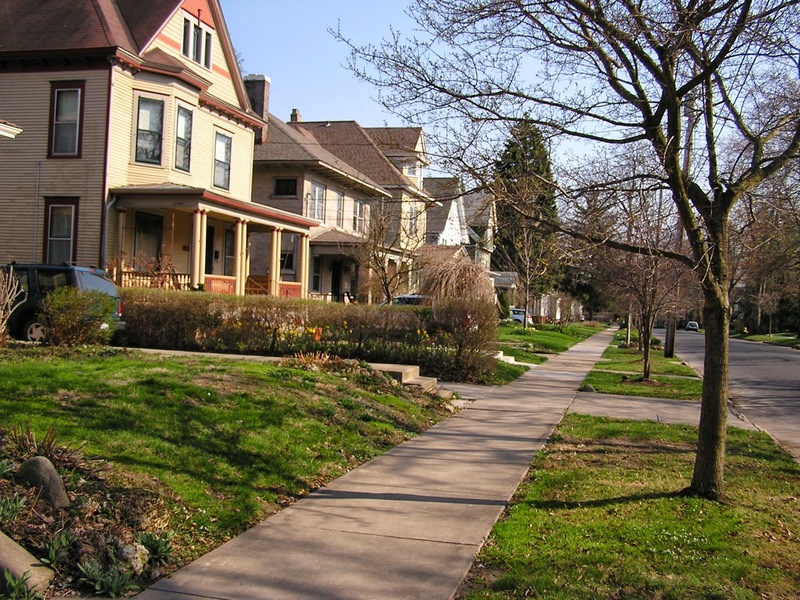 We'll explore the history of the street's development, and the architecture of many of its early 20th century houses. James Pennock was born in Yorkshire and came to America with his family in 1854. He was in the shoe business for many years in Boston and Kansas City, where he began to deal in real estate. He moved to Rochester in 1888, and soon thereafter bought eight acres on East Genesee Street in Syracuse and laid out Allen Street following the most modern principles. He developed and built impressive houses designed by the prominent architectural firm of Archimedes Russell. He sold these new houses ready-built beginning around 1902 . Pennock himself built two homes in 1910-12 at the intersection of Allen and East Genesee. For his own residence he built the large gray brick house on the comer designed by noted local Albert Brockway. On Allen Street he built what newspapers at the time called an "English cottage" for his daughter, Mrs. Charles B. Gould. Previously, Mrs. Gould lived at what is now 470 Allen Street, a house with unusual Gothic detailing. Pennock's house built in the American Renaissance style, now serves, much altered after a fire, as the offices of Dr. Philip Falcone. It was described at the time of its erection as “an American home." Miss Harriet S. Curtis has broken ground for a modern House in Cambridge street, Seventeenth ward, which she will build at a cost, of $7.000 for investment. It is to be a twelve-room house- with hardwood finish and all improvements. Miss Curtis will direct the construction and it is the plan of Miss Curtis to build several houses in this section of the city. These houses, which still exist are similar in form to those built by Pennock on Allen Street, and judging from information on Sanborn insurance maps it seems that Curtis built at least five houses before 1910. At the corner of Cambridge and East Genesee, where the firehouse is today, the Bastable family also had an impressive house. Most of the lots on Cambridge were purchased and built upon after World War I. Colonial Revival houses were popular in the 1920s. 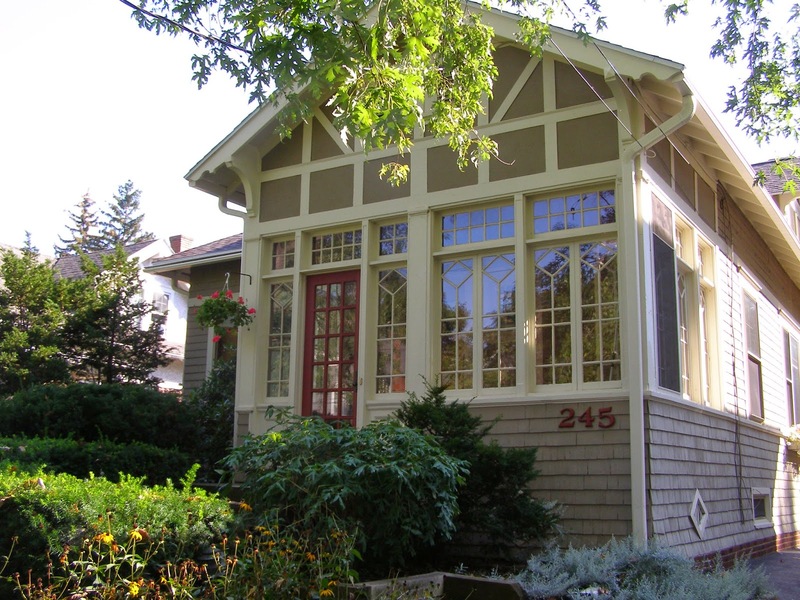 There are a few examples of bungalows with arts and Crafts details of different types. Already in the 1920s, but especially after World War II, Cambridge was popular street for middle class Jewish professionals. Syracuse, NY. 726 Lancaster Ave. (formerly 114 Lancaster). Justus Moak Scrafford, architect (1910). Photo: Samuel D. Gruber 2013. Last Sunday we took our second of this spring's Westcott Sunday walking tours and explored the few blocks west of Westcott Street and north of Euclid Avenue that climb the Clarendon Street hill. 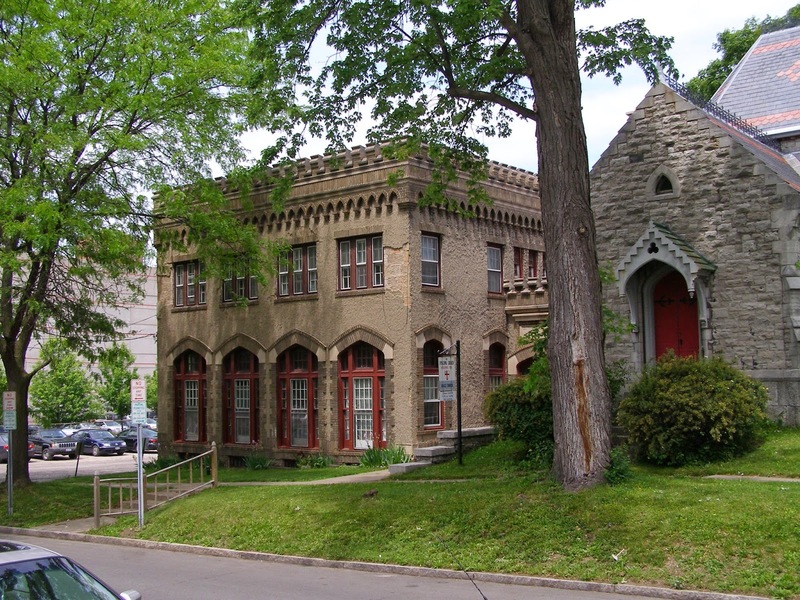 The walk began on Euclid Ave. where the former Engine House 10 (now Westcott Street Community Center) and the grand Queen Anne style Loomis House are among the oldest in the neighborhood. But this year we especially looked at the role of local architect Justus Moak Scrafford (1878-1947) who, together with Clarence S. Congdon, especially helped shape the area with a series of fine colonial style houses built on Clarendon Street and Lancaster Avenue between 1909 and 1914.
Who was Justus Scrafford? Despite his affiliation with Syracuse University, the location of Scrafford's papers is not known, so information on his work comes mostly from newspaper references. Thanks to some research by Travis M. Bowman, and some addition sleuthing on my own for the Westcott tours, we now know that Scrafford attended Syracuse University where was an editor The Onondagan, the junior yearbook for which made many illustrations, and he was also on the track team and in 1900 competed in the 800 meters in the summer Olympics in Paris. After graduation Scrafford worked at the New York City architecture firm of Trowbridge & Livingston until he was accepted at the Ecole des Beaux-Arts (School of Fine Arts) in Paris. After graduation from the Ecole, he returned to Trowbridge & Livingston for a year, until he was hired as an Associate Professor of Architecture at Syracuse; where he was made full professor in 1913. 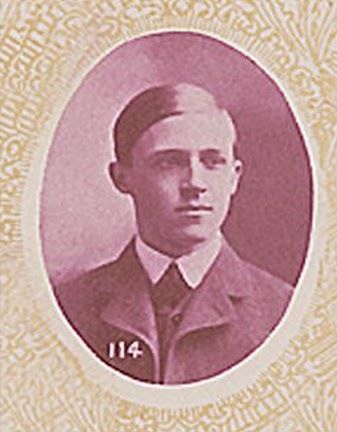 In addition to teaching at Syracuse he was especially active as a local architect between 1910 and 1920. He designed many houses, mostly it seems in the English Colonial style, but also was the architect of the Bellevue Country Club, of which he was a member, and several churches including Erwin Methodist Church on Euclid Avenue near Westcott Street, not far from his house on Lancaster Avenue. 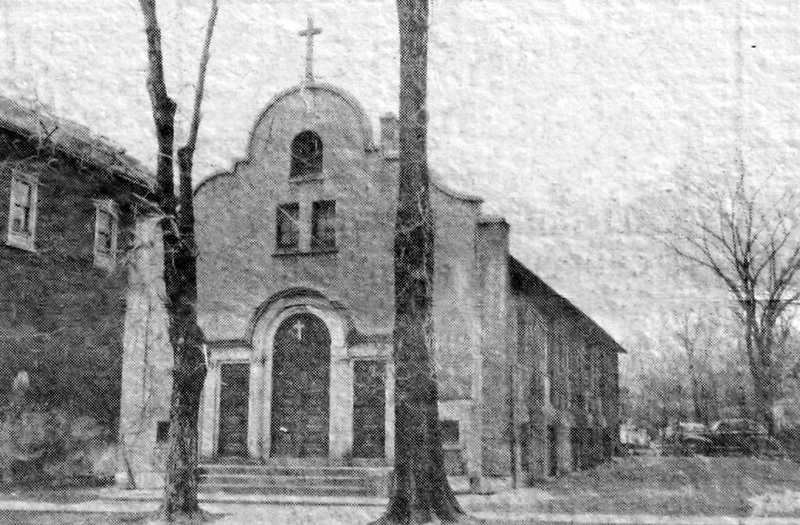 He also designed the Parish House at Grace Episcopal Church on Madison Street at University Avenue in 1913 and St. Philip's Episcopal Church which opened in January 1922 and closed in 1957, when the congregation merged with Grace Episcopal Church. Scrafford's building was later torn down along with much else in the 15th Ward. Scrafford's religious buildings were built in varied styles, but never employing predictable historicism. They combine Arts & Crafts and more exotic elements. Syracuse, NY. Erwin Methodist Church on Euclid Avenue near Westcott Street. Justus Moak Scrafford, arch. (1911). Historic photo. Until recently, only Scrafford's own house at 726 Lancaster Ave. was identified. 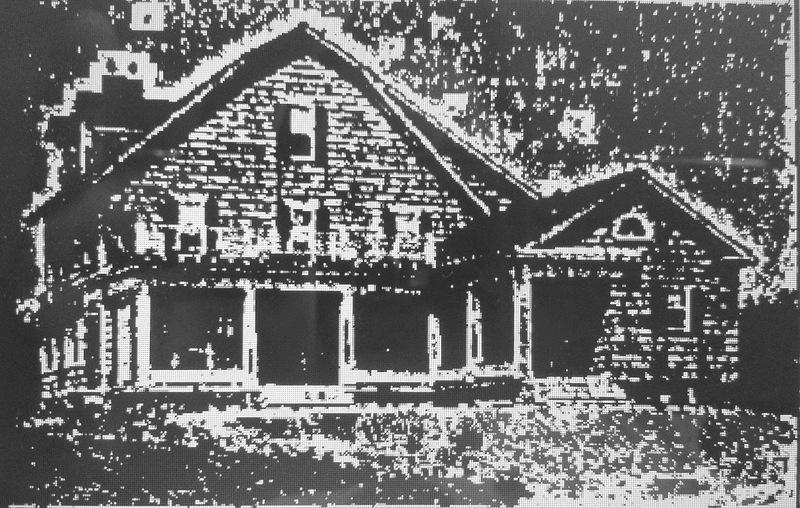 The house, now owned by Grace and Michael Flusche, was featured in the Real Estate section of The Post-Standard with a picture on Aug. 26, 1910. In 2010, the Flusches celebrated the centennial of the house with a neighborhood party. The front porch has wide, fluted Doric columns with two sets of French doors that open to the living room. The foyer features an open oak staircase with a spiral-shaped newel post, and an archway with a keystone. The 14-by-15-foot dining room has a quarter-sawn oak floor and a coffered ceiling. It opens to a screened-in porch with 10-foot-high columns, beadboard ceiling and bluestone slate floor. The porch has a pass-through into the kitchen to make serving easy. 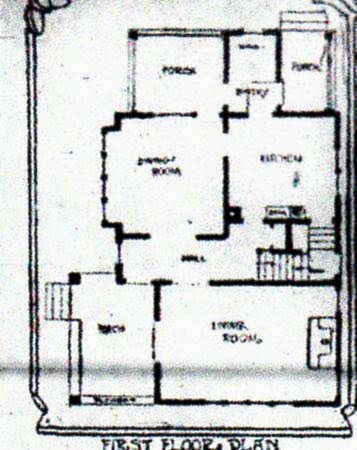 The house also has a wing on the back, which Scrafford designed as a self-contained living area with a butler's pantry, full bath, bedroom and sitting room. Syracuse, NY. 721 Lancaster Ave. Justus Moak Scrafford, architect (1911). Photo: Samuel D. Gruber 2013. Scrafford's presence in the neighborhood, and his teaching at Syracuse University brought new commissions. The next year (1911), he began a fine large brick house across the street at 721 Lancaster Avenue for his University Colleague, librarian Paul Paine and wife Elizabeth. The three-story house has a symmetric facade with a modest projecting aedicule type entrance porch in front of a neo-Federal style doorway, with sidelights. The third floor is the attic level, but it has a high roof with three large dormers, providing a well-lit living space. The Paines moved into the house in 1912. Paine was a librarian and lecturer at SU and from 1915 to 1942 he was Director of the Syracuse Public Library. The public library in Eastwood opened its present building on March 19, 1958 with ceremonies and was named the Paul Mayo Paine Branch. Syracuse, NY. 317 Clarendon St. Justus Moak Scrafford, architect (1912). Photo: Samuel D. Gruber 2013. In 1912, Scrafford built a similar, but even more impressive house atop the hill at Clarendon and Ackerman Avenue for the Edward and Daisy Torbert Family. This large well-sited house was one of several homes of prominent Syracusans erected in a second phase of building at the crest of Clarendon Street. One reason these houses are so much more impressive than their neighbors is that they sit on wide lots, allowing full facades, and these are set fairly close to the edge of the hill and are thus fully visible from the street below. This colonial Revival house is notable for its full four-column Doric porch with a decorative balcony rail above, and its three bold projecting third floor dormers, set into a hipped roof, with a fourth dormer facing east. The siting of the house provided impressive views to the south form all the upper floor windows. The big lot behind opens all the way to Thornden Park, and include a large garage in the same style as the house. The garage has an upstairs apartment, and is equal in size to many nearby residences. Edward L. Torbert (1877(? )-1966) was an officer and later Director of the Onondaga Pottery Company, which later became Syracuse China, for 62 years. He was born in Davenport, Iowa. Named assistant manger of Onondaga Pottery in 1910, he filled many administrative posts with the company until his retirement in 1961. At different times Torbert was president of the United States Potters Association and the American vitrified China Association. Involved in civic life, he served as Chairman of the Onondaga County Parks Board from 1929 to 1960, and on the boards of numerous pother civic organizations. Daisy was active member of the Asa Danforth Chapter of the Daughters of the American Revolution and other civic groups and hosted meetings at the house beginning from 1925. The house was sold after Daisy Torbert's death in 1952. Now owned by Trinity Fellowship congregation, it has supported the large family of Jeremy and Lucinda Jackson since 1979. Jeremy Jackson has co-pastored Trinity Fellowship since its foundation in 1978. In 1913, a newspaper notices suggest that Scrafford built a house for F.M. Featherly at 701 Euclid Ave., on the northeast corner of Lancaster and Euclid. Featherly dealt in china at his business F.M Featherly, China at 209 West Fayette St.. Featherly's is a house of flats - two stories of separate but probably equal apartments. This type of house was becoming common in the neighborhood at this time. Owners often lived in one unit and either rented the other, or it was used by a family member. The house is well proportioned, and when new would have looked simple, though handsome. There is nothing, however, in the design of the that distinguishes it from many others of the type. In 1914, Scrafford teamed with builder W. A. Schuyler, and is mentioned as the architect of a house "at East Genesee Street and Columbus avenue, overlooking Columbia Park," (Post-Standard, July 11, 1914). This is almost certainly the house at 1828 East Genesee Street. "Justus A. Scrafford. architect, la getting out plans for an English house to be built at East Genesee street and Columbus avenue, overlooking Columbia Park, by Mr. Schuyler. This will be covered with wide clapboards painted white and the entrance will be on the side- The living and dining rooms will occupy the major part of the first floor and there will be three rooms and bath on the second floor. Across the front there Is to be a spacious porch. The entire Interior will be finished In white enamel. Ground will be broken Monday and the house will be completed September 1 at a cost of $6,000." Scrafford and Schuyler worked together again in 1916, on a house for J. W. Breads, at 314 Lennox Avenue. 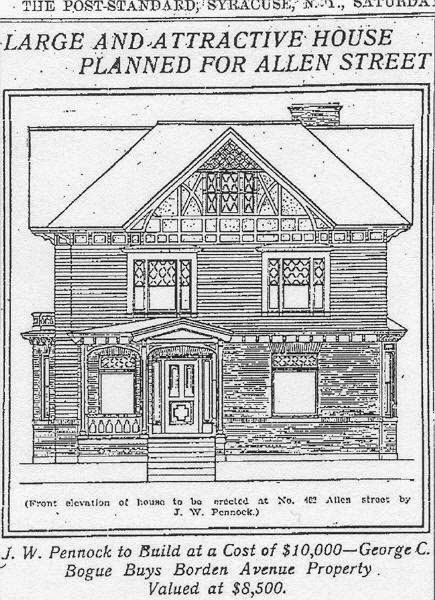 This house was featured with photos and a plan in the Syracuse Herald (June 18, 1916) as a "striking example of the economy of space in a semi-bungalow." The house stands in good condition - it was among the first in the Westcott Tract when it was built, but now is surround by other houses - many of them semi-bungalows not too different in exterior appearance. Of course, in 1916, the semi-bungalow in many variations was a staple of house plan and house material handbooks and catalogs. Syracuse, NY. Hugh P. Baker House. Justus M. Scrafford, arch., (1915). Photo: Syracuse Post-Standard, May 15, 1915. I'll end this incomplete list of Scrafford's work with mention of a house designed In 1915 for Hugh P. Baker (1878-1950) the second and fourth Dean of the New York State College of Forestry at Syracuse University (now SUNY-ESF) from 1912–20 and 1930–33. Baker put his stamp on the school and promoted its specialization in the study and application of wood resources. He later served as president of Massachusetts State College from 1933–47, now the University of Massachusetts Amherst. The property in the new part of Syracuse opens on East Genesee Street, the Salt Springs Road and Ferris Avenue and there is already started a considerable amount of building. Before the annexation several attractive homes were built in that section which is served by the Syracuse and Suburban Railroad. One of the most recent of these is the year round home of Dr. Hugh P. Baker dean of the New York State College of Forestry, Syracuse University. It is a large house with many attractive features and is surrounded by rolling country of a picturesque character. From Dr. Baker's sitting porch it has a view across country as far as Fayetteville. He is busy landscaping the grounds and planting trees and shrubs. Justus M. Scrafford was the architect of the residence. I've tried to locate this house without success. When built it had no street address, but it seems to have stood on the south side of Salt Spring Road between Seeley Rd.and Gorland Ave.. No houses there match the newspaper photo. 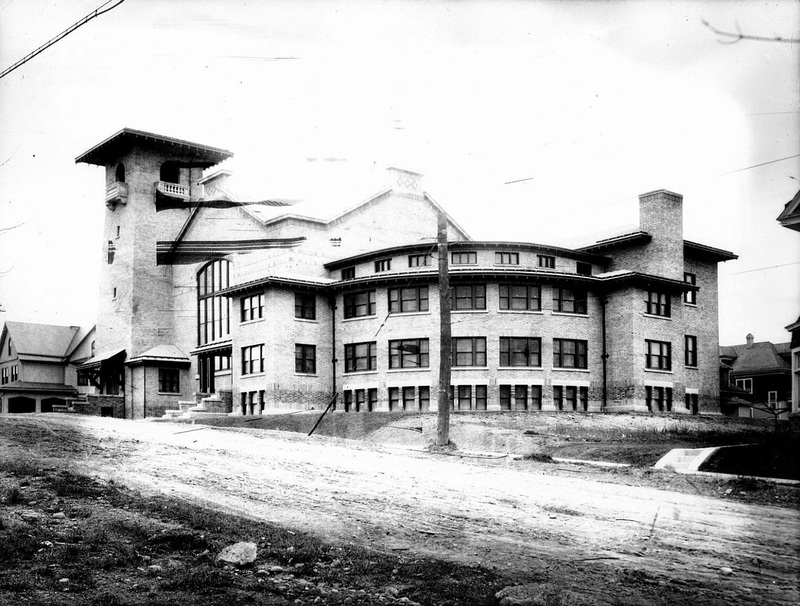 Baker left the house in 1920, and it may have been torn down for the construction of the Charles Andrews School in 1923. When Baker returned as College Dean in the early 1930s, he lived at 113 Berkeley Drive, now the home of Chabad Rabbi Yaakov Rapoport. This essay is just an introduction to a forgotten Syracuse architect. We still know little to nothing about Scrafford as a person or as a teacher, and his approach to architecture needs to be more fully considered. Along with several contemporaries such as Clarence S. Congdon, Gordon Wright, and Ward Wellington Ward he helped shape Syracuse's Eastside, and also played an important role in the shift away from 19th-century ornamental styles in middle-class house design. His work was contemporary but separate from Arts and Crafts practitioner Ward. His English Colonial style offered an establishment alternative architecture well-to-do professionals. From now on, we'll keep an eye open to identify more of Scrafford's work, and perhaps to find his papers or other documentary evidence of his work.